Let me prove to you how I can help your children gain the confidence, coordination and self-control to give them a huge edge in life. My name is Clyde Arnold and I have been the martial arts program director here at Top Flight Gymnastics since 2007 and teaching in Northern Kentucky since 1995. I’ve made it not just a goal but my passion in helping children, like your own, to dramatically improve the quality of their lives. We all want to give our children a strong foundation for success in life. My professionally developed martial arts program for children has been designed to develop confidence and coordination in children. Arnold Martial Arts provides an all inclusive rotating MMA (Mixed Martial Arts) curriculum that is kid friendly with special emphasis on the traditional values and training that other martial arts have to offer. It Has to Be Fun Too! For the kids in our program, one thing matters – FUN! Our kids have a great time in class, but we work hard to make sure the program has lasting value for each child. 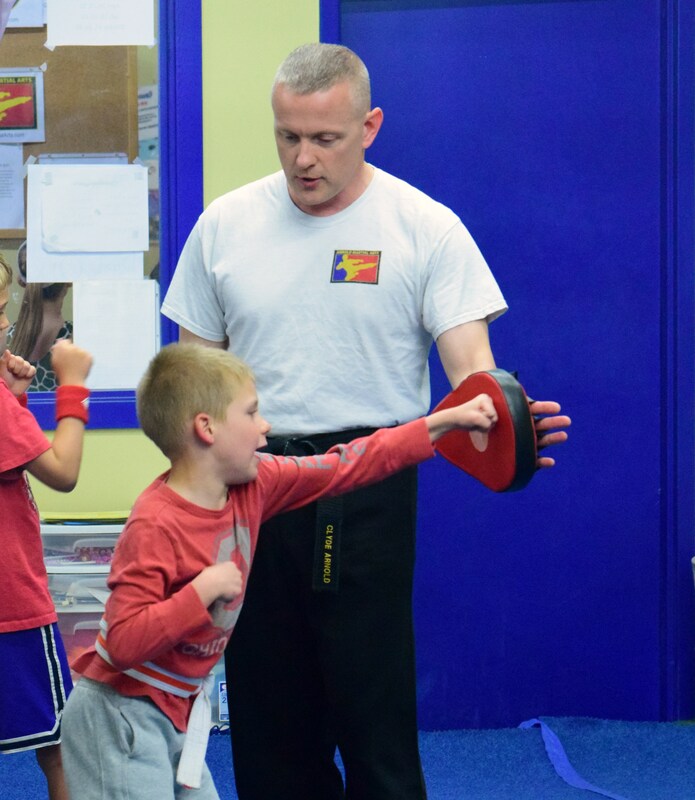 The exciting punching and kicking techniques capture the child’s attention while opening the door for improvements in confidence, self-discipline, self-control and self-defense. Our belt system is the key. Your child will start as a white belt and then move through the belts all the way to black belt. As we prepare him or her to earn each belt, his or her skill level and confidence improves. Each belt presents a new challenge that your child will learn to meet and exceed. Our parents tell us this process gives their children an unshakable confidence that improves all areas of their lives. Their grades get better. They’re better behaved and they gain the confidence to say NO to peer pressure. One of the benefits that parents appreciate most about our classes is the improvement that they see in their child’s discipline and self-control. We will teach your child that black belt represents excellence. Even if he or she is not a black belt, he or she can have the black belt attitude and this is engrained in every class. We will teach your child that when they are in school, to ask him or herself, “How would a black belt listen to the teacher? How would a black belt do this assignment?” This has proven to be very powerful for motivating students to make massive changes in their behavior and attitude. We’ll teach your child to protect him or herself in a safe and supportive manner. He or she will be taught not only what to do, but when to use these skills. We don’t want our students to misuse this, so we work hard to instill a sense of responsibility with this training. Most of our kids never have to use the skills of self-defense. But the confidence your child will gain from knowing he or she can handle everything from a teasing to bullies, will help in all aspects of life in the future. When starting to learn MMA, kids are first introduced to a dedicated fitness regime, which will best prepare them for the exertions ahead. Concentrating on working all muscle groups, particular attention will be paid to the cardiovascular routines to help control breathing and the response of the body to exercise. Understanding how the body works and reacts to certain external forces, aids a better understanding of how to achieve the best results from correctly applied working practices. The discipline and self-confidence that children acquire in our Kids MMA program helps them grow into well-rounded adults and empowers them to more effectively handle problems, including bullying. We acclimate kids to an active, healthy lifestyle, and build the character, self-esteem and interpersonal skills necessary for peaceful conflict resolution while stressing the importance of safety and cleanliness. Kids with character have powerful coping strategies for dealing with and resolving confrontations with peers, and kids with self-defense have powerful skills to deal with and resolve physical abuse. Students can successfully acquire many life skills that combine tradition with the most effective forms of personal protection. Through this approach, students are provided the most realistic training available in a safe, fun, friendly and truly diverse training environment. In Mixed Martial Arts, no one sits on the bench. Everybody plays, every class. MMA is built on a culture of total fitness. No other sport offers kids an all-around workout like MMA. It is a method of study that fosters great care and respect for others. By routinely working with partners, students learn to take care of their fellow human beings. In MMA, students learn to feel comfortable with a partner in their personal space, whether standing up or on the ground. This type of emotional conditioning instills confidence like few other classes. MMA is cool! No doubt about it. Martial arts has a “cool” factor that has no equal. In short, MMA has it all: discipline, honor, fitness, self-defense, and fun. This 5-7 year old program is an age and ability appropriate, specially designed training program that teaches the understanding of body movement. The primary focus is to develop fundamental basics, creating a solid foundation to build upon in the older years such as balance, coordination, cooperation and respect. At this level, execution of powerful and precise techniques will be obvious as well as improved concentration, self assurance, confidence, and respect. Just as important as the blocks, kicks and punches learned is the lesson of patience. The importance of repetition to reinforcement perfection will become evident to every beginner as self control grows. As well as deepening their training, children are now introduced to a more thorough method of the teaching and learning process essential to continued success. The stances and precise movements build strength, stamina, focus, breath control, balance, and coordination. The teen class includes beginner and intermediate students. The curriculum and benefits of the training are that of the other youth programs but the training is presented in a manner that is appropriate and enjoyable for their age. Teens will enjoy the increase in athletic skills and confidence. This class is also an excellent bridge for those moving on to Black Belt and beyond. Click here for the complete class schedule.